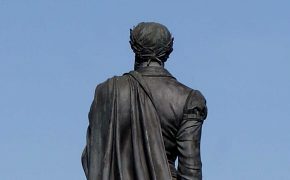 Spread across the city, placed on the façades of buildings, we find countless plaques indicating that in that place a notable personality was born, lived or died. But what is more surprising is existing seven plaques in the same building; this is the case of the house of the evocative plaques in Bairro Alto. Plaques are testimonies of moments of the city’s history and of the citizens’ life. 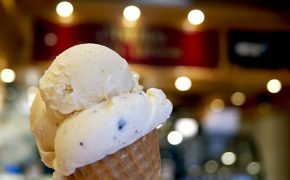 More or less elaborated, of different shapes and sizes, we can find them everywhere and they certainly deserve our attention. 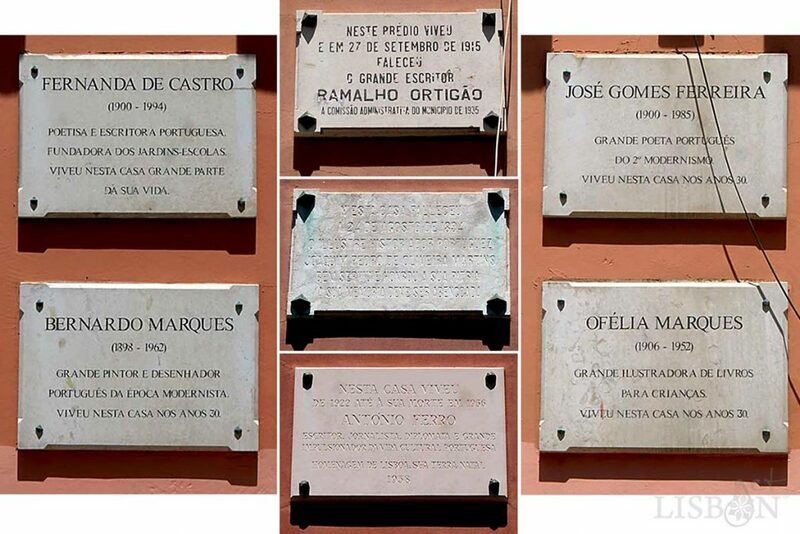 There is a building in the centre of Lisbon that displays seven evocative plaques relative to the same number of personalities that stood out in the cultural life of the city and the country. Although it is centrally located, it is not exactly a popular place, and even to those who go past it every day, this can be a novelty. 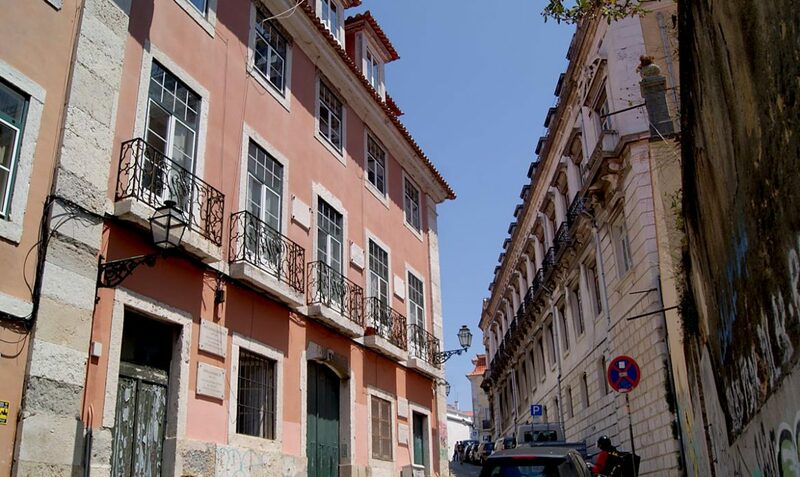 We’re talking about the no.6 of the Rua João Pereira da Rosa, former Calçada dos Caetanos, a building next to the National Conservatory. 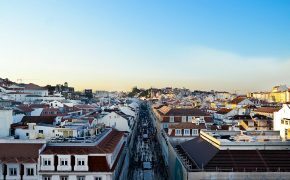 The honoured personalities in the house of the evocative plaques in Bairro Alto marked the panorama of the plastic arts and of literature of the 19th and 20th centuries. Let’s get to know them! As you can read in one of the evocative plaques, placed by the municipality in 1935, lived and on September 25, 1915 passed away the writer Ramalho Ortigão (Porto 1836 – Lisbon 1925) in this building. In fact, the famous writer lived in the attic and passed away there, victim of cancer. He was one of the protagonists of the illustrious Geração de 70 (Generation of the 70’s), a political, artistic and literary revolutionary movement of the 19th century that introduced the Realism, and later on, one of the self-entitled member of Vencidos da Vida, an informal group of the same intellectuals that, disappointed with the failure of the modernisation process that they had defended in their youth, would gather in elegant gastronomical gatherings, using humour as a form of expression. One of the most illustrious figures honoured in these evocative plaques lived on the 1st floor and passed away there in 1894. He was Oliveira Martins (Lisbon 1845 – Lisbon 1894), one of the key people of the Portuguese contemporary historiography. Another one of the authors of the Geração de 70, controversial and multifaceted, as it was characteristic of the intellectuals of the 19th century. The same floor was later on inhabited by the couple António Ferro (Lisbon 1895 – Lisbon 1956) and Fernanda de Castro (Lisbon 1900 – Lisbon 1994). He, journalist and politician connected to the dictatorial of Salazar, was very active in the fields of propaganda, tourism and cultural activities in general. She was a writer, poet, translator and founder of the kindergartens. The evocative plaques that honour them reveal that they lived here from 1922, year of their wedding. Another couple, this time related to the plastic arts, lived, in the 1930’s, on the 2nd floor of this peculiar building: Bernardo Marques (Silves 1898 – Lisbon 1962) and Ofélia Marques (Lisbon 1902 – Lisbon 1952). He, a prominent figure of the 2nd generation of modernism, became particularly famous as a graphic artist, designer and decorator. She also developed her own work as a self-taught designer, standing out as an illustrator of children’s publications. Last but not least, another remarkable name of Literature in Portugal completes the list of the honoured residents of the house of the evocative plaques in Bairro Alto. José Gomes Ferreira (Porto 1900 – Lisbon 1985), a law graduate, writer, poet, journalist and anti-fascist and democrat political activist, lived here in the 1930’s with his first wife Ingrid. 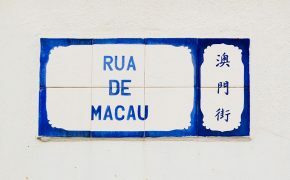 Not being among the seven illustrious on the plaques, but still on the list of prominent residents, we also mention the Swiss artist Fred Kradolfer (Zurich 1903 – Lisbon 1968), that alongside Bernardo Marques integrated the group of decorating artists of the Secretariat of National Propaganda, promoted in 1933 by António Ferro. 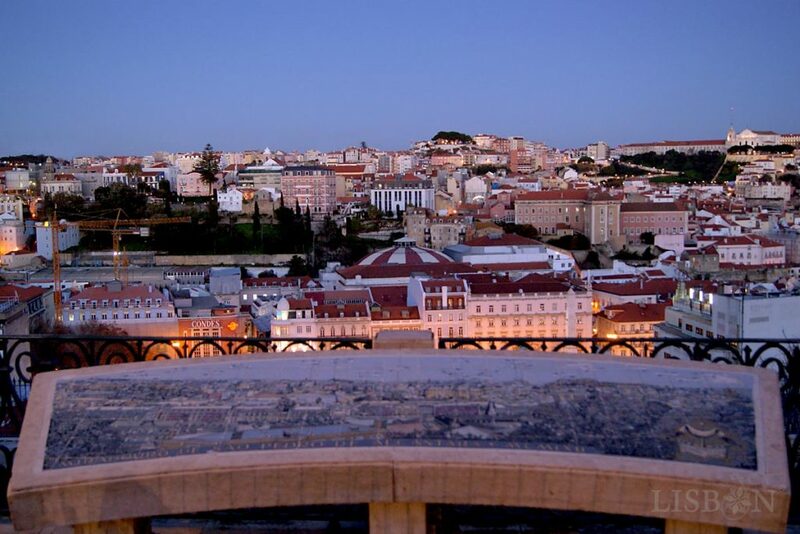 From his work we highlight, as a curiosity, the tile panels produced by the Viúva Lamego Factory, with the representation of the views of the city that we find in the São Pedro de Alcântara Viewpoint (1962), São Jorge Castle Viewpoint (1963), Nossa Senhora do Monte Viewpoint (1963) and Monte Agudo Viewpoint (1965). 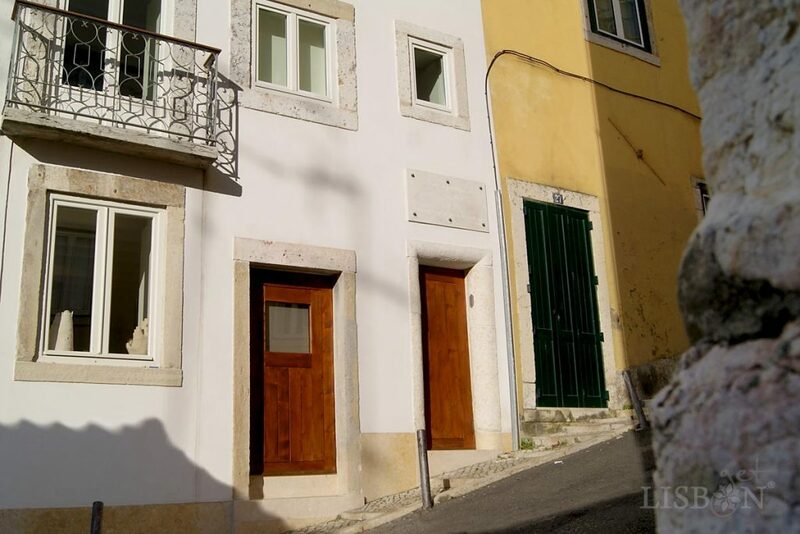 The house of the evocative plaques in Bairro Alto is undoubtedly a peculiar building with many stories to tell. 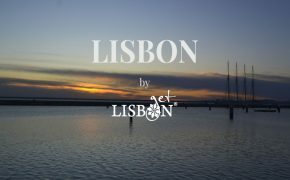 Since we’ve talked about the house of the evocative plaques in Bairro Alto in this article, where artists and writers lived and passed away, we thought it would be pertinent to mention two more relevant addresses in this neighbourhood that contain many stories related to illustrious personalities connected to culture. 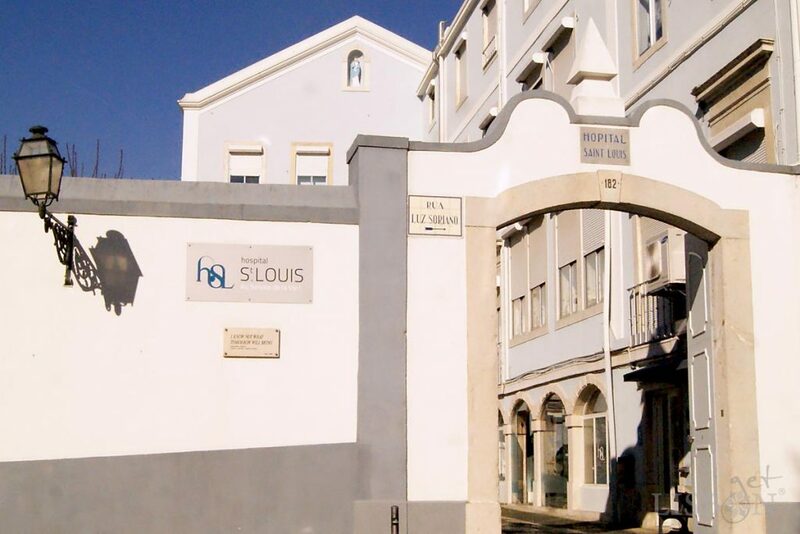 In the Rua Luz Soriano is the Saint Louis Hospital, place where the famous poet Fernando Pessoa (Lisbon 1888 – Lisbon 1935) and the multifaceted plastic artist Almada Negreiros (Trindade, São Tomé e Príncipe 1893 – Lisbon 1970) passed away. Further down, in Travessa André Valente no.25, we find the last address of the pre-romantic poet Bocage (Setúbal 1765 – Lisbon 1805) that passed away there when he was only 40 years old.